let’s get into it. who needs intros when there’s cookies (toasted almond thumbprint cookies, to be exact) waiting for you? i used almond meal (6.75 oz, which was the weight of 1 1/2 cups whole almonds) that got toasted dry on the stove-top instead of grinding my own almonds. ain’t nobody got time for that. and i added almond extract for even more almondy-ness. if you’re into the flavor of almond paste/marzipan (i’m dreaming of a white christmas green princess cake), then add the almond extract. used #60 scoop (a little over 1 T, and i got 52 toasted almond thumbprint cookies), and rolled it in granulated sugar. no raw sugar in the house (;___;). no need to roll the dough into a ball either, just plop it straight into the sugar. it’s a little soft, so coat them gently in sugar. you might be tempted to space them closer than 2” apart; that’s okay, do it, an inch should suffice. you also might be tempted to make the the walls thin and high; just stick your thumb in and be done with it, because otherwise the cookies look like they have a baby dip instead of a crater. and because of this, resist the urge to fill them before they bake. the first round i spooned jam into the holes, popped them back in the oven for 2 minutes (after they had baked for the initial 12 minutes), and smoothed out the melty jam. the second round i melted the jam, then spooned it in, and it was a lot easier. thank goodness for moms and their smart suggestions. these toasted almond thumbprint cookies are sturdy enough to be moved using the claw (aka my fingers) and without needing a spatula. yet when you bite into one, it’s super tender and flaky. there’s the almond, present but not overwhelming. the sugar adds a delicate crunch, and i didn’t miss the raw sugar, shockingly enough. the apricot jam was a nice accent, with a bit of its tartness. 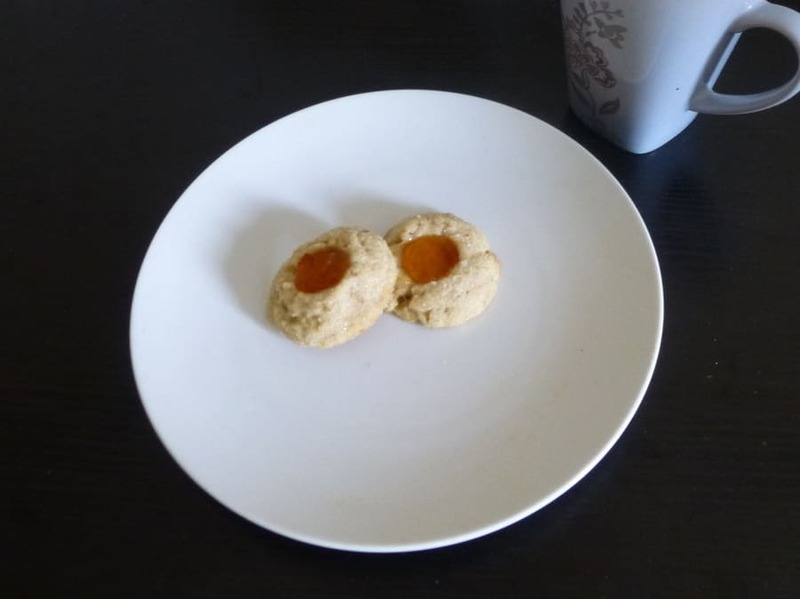 if the thumbprint business seems like too much of a hassle, i could see these being plain drop cookies with a slivered almond pressed into the top (or not even). either way, i’m sure you and your cookie eaters will be very happy. Combine dry ingredients. Cream butter and sugar. Add egg and vanilla. Gradually mix in dry ingredients; mix just to combine. Place raw or granulated sugar in a shallow bowl. Scoop out dough by the tablespoonful and roll into balls (if dough is sticky, chill 20 minutes). Roll in sugar and place on parchment-lined baking sheets, spacing 1” apart. Using your thumb, make a deep indent in each ball. Make sure to keep the walls thick. Bake at 375F until golden, 12–14 minutes. Cool on wire racks. Fill with jam or curd.